It’s amazing to think about what hitting a little white ball into a hole has become. Especially in British Columbia - one of the greatest places on earth for an unforgettable golf vacation. Mountain golf is the specialty here, from Victoria to the Vancouver Islands to the spectacular Okanagan Valley. There are also a select few British Columbia golf resorts that continually redefine the great BC golf getaway. Here are our Top 10! A unique golfing destination awaits at St. Eugene Golf Resort & Casino! The Ktunaxa history and tradition persist from corner to corner and you are about to experience it. Indulge in stunning views of St. Mary River and the surrounding mountains. St. Eugene Golf championship 18-hole, par-72 course, which was designed by renowned architect Les Furber. This beautiful course offers you an excellent tee time! You don't have to worry if this is your first time playing or if you haven't played in a long time, you can always sign up for lessons right on site and get all geared up at the on-site pro shop. Top off your golf getaway with a delicious meal at their 19th Hole Bar & Grill which overlooks the 18th fairway and putting green! St. Eugene Golf Resort & Casino's 18 holes have Ktunaxa names in the traditional language! Take a look at their unique signs that display the Ktunaxa traditional expression along with the phonetic and English translation! Some people might know Predator Ridge for its outstanding golf. After all, these 1,200 Okanagan Valley acres form some of the ultimate surroundings for golf - anywhere. If you’re a golfer, this is crucial knowledge. But that’s not all that makes Predator Ridge our #1 BC golf resort. The spectacular links-style 18-hole course, one of the only public courses in western Canada to make the Score Magazine Canadian Top 25, highlights the hotel’s serene valley surroundings - a BC golf vacation that’s not a typical lakeside experience, not a typical resort experience…not typical at all. Known as the Osprey course, it features spectacular elevated green complexes showcasing the Okanagan Mountains; the breathtaking eighth hole is 578 yards of pure nerve. Even if you don’t have nerve, or you’d just rather do something else for a day or two, you should know that Predator Ridge is now a full-service resort - the only one in the Thompson-Okanagan region with golf, a spa and full-service hotel on one property. It’s a combination that is fast redefining the Okanagan Valley getaway. The studio, one- and two-bedroom hotel-style suites at Predator Ridge offer a mountain aura that is at once rustic and refined. They combine with elegant, Craftsman-style course-side cottages that complete your BC golf getaway. Predator Ridge is approximately 430 kms (240 miles) from Vancouver and 600 kms (360 miles) from Calgary on Highway 97. Predator Ridge is 150 km (90 miles) north of the United States Border, and is easily accessible by air via Kelowna International Airport and by bus or car via Highways 1, 3 or 5. In 2010, Predator Ridge will unveil an additional 18 holes of mountain golf, designed by renowned architect Doug Carrick and equaling the unbridled beauty of the current 18. Whistler is well-known worldwide for its Blackcomb and Whistler Mountain skiing, and in the summer it’s becoming equally well-known for golf. We think that’s largely because of courses like this one at Fairmont Chateau Whistler Golf Club, which makes for a can’t-miss Whistler golf vacation. This 18-hole, par 72 course was designed by Robert Trent Jones, Jr., and to say that it was built into the Coast Mountains is almost inaccurate. Instead, it’s been designed almost on top of the landscape, with just enough blending around the edges to make it seem a part of the Whistler mountain beauty. There are all types of terrain here: granite rock faces, creeks and ponds, tall fir trees and subtle yet profound elevation changes. If not for the GPS system in your golf cart, you’d think you were on a very refined nature hike. Which is an impression that’s easy to experience even at the resort building itself. The architecture of the Fairmont Chateau Whistler mimics the surrounding peaks, and inside are all the fineries of a luxury Whistler golf vacation: a health club, a culinary team preparing the finest Pacific Northwest cuisine, holistic treatments at the Vida Wellness Spa and more. There are seven terrific dining options at the Fairmont Chateau Whistler, including the elegant Wine Room and the grand hotel ambiance of the Mallard Lounge and Terrace. As part of its commitment to maintain, enhance and protect the fish, plants and wildlife of the Whistler area, the Fairmont Chateau Whistler is a fully-certified Audubon Cooperative Sanctuary. The Fairmont Chateau Whistler features a golf shop with TaylorMade club and shoe rentals, warmup putting and chipping greens and the David Leadbetter Academy. Juniors 10 - 18 play free with a paid adult! This is a place for people who don’t just like to play golf - they like to live golf. Even if you’re just here for a Comox Valley golf vacation, it will always seem like home - because for many people here, it is. Homes and vacation villas are centered around a 48,000-sq.-ft. resort centre. And, naturally, the golf course itself. This 18-hole, par 72 course is highlighted by the surrounding Beaufort Mountains. It presents a picturesque, challenging experience filled with tall trees, undulating and sloped greens, 11 lakes and well-placed moments requiring a steely resolve. The par 4 18th hole is one of those moments, but it caps a day of exhilaration - no matter how many times you play the course. The one- and two-bedroom villas are both charming and luxurious at the Crowne Isle Resort, and they’re accompanied by Fairway Rooms with private balconies and views of the first fairway. And you won’t believe the marble and mahogany treatment inside the three-level resort centre. This is the BC golf vacation you’ve been dreaming of - you’ve never had one like it. A Cigar & Cognac Room and Classic Car Museum features a collection of vintage 1950's and 1960s Chevrolets and Fords, some previously owned by celebrities including Sylvester Stallone and Mary Hart. The onsite fitness centre offers men’s and ladies’ steam rooms and whirlpool. The resort centre also houses a wide array of meeting and banquet rooms, perfect for upscale meetings, weddings and events. That’s high praise, and it’s deserved: from its back tees, this course has the highest slope rating in Canada. It’s also classic mountain golf, and not just because of the views of Mt. Baker and Mt. Finlayson that you’ll catch along its 7,200 yards. It’s full of sand and water hazards, not to mention the small canyon you shoot over on the seventh hole. There is more - 18 holes more, in fact. The 6,807-yard, par 71 Valley Course is recently opened and highlights all types of BC landscapes including rivers, lakes, forests and creeks. This one was also designed by Nicklaus - making the Westin Bear Mountain Golf Resort & Spa the only facility in Canada with 36 holes of Nicklaus golf on site. Accommodations at Bear Mountain Golf Resort include 156 guestrooms and king suites, all with the finest Westin accommodations and services. The Westin Bear Mountain Resort & Spa is located 30 minutes from downtown Victoria, BC. It is easily accessible by car, motorcoach, ferry, rail and through the Victoria International Airport. The onsite Sante Spa incorporates medical, fitness, nutrition and wellness elements for truly complete spa services. Talking Rock Resort and Quaaout Lodge is owned by the Little Shuswap Indian Band, and their namesake lake awaits you on the 18th hole of the Talking Rock golf course following 7,142 yards of world-class golf. This is the highlight of your Chase, BC golf vacation, but it’s just the beginning. Actually the championship par 72 tournament-style course was the beginning of the resort itself, planned initially by architect Les Ferber in 1994 and completed by Wayne Carleton and the Band in late 2006. It’s a study in forest, mountain and BC lakeside beauty, and blends First Nations art and tradition throughout. You wind up near the beach, and your experience just gets better from there. Actually your entire Thompson Nicola golf getaway at Talking Rock is steeped in First Nations culture, including the cuisine and the architecture. The Quaaout Lodge entrance is designed as a traditional winter home, or kakuli, and along with the expected resort activities you can enjoy cultural Native American experiences including the onsite sweat lodge - a truly enriching BC golf vacation. Quaaout Lodge encompasses 66 lakeview rooms and six Deluxe Jacuzzi Suites. You might hear “Waykt” a lot at Talking Rock Resort and Quaaout Lodge. That means “welcome” in the Shuswap native language. To help you unwind between rounds, Talking Rock Resort and Quaaout Lodge features an indoor pool, steam room, gym and whirlpool. We’ve learned that any resort with “village” in the name is definitely worth a visit. At Panorama Mountain Village, everything is worth it: the family fun, the range of accommodations and the endless outdoor activities. And if you’re a golfer, get ready for the round of your life at Greywolf. Even if you’re used to mountain golf, the 7,140-yard Greywolf golf course carved into the Kootenay Rockies will take you by surprise. Designed by architect Doug Carrick, the course required two long summers just to build - but you’ll be glad they did. You’ll likely never experience a more captivating collection of par 3s, or notice every inch of a 400-foot elevation change. The stunning - and excruciating - sixth hole, called the Cliffhanger, is sure to be a hole you’ll never forget. And that’s just one hole. All of this is just part of the aforementioned village, which includes condos, townhomes and inn rooms for any style or budget and activities including ATV tours, a kid’s Fun Zone, tennis, wagon rides, massage at SolSpa…and on and on. And that’s just in the summer! In the summer, the base of the Mile One Quad Chair at Panorama (yes, it’s a fantastic ski resort too) transforms into a fabulous beach volleyball court. Sports equipment of all types is available at the onsite Adventure Centre. Panorama Mountain Village is located in British Columbia, 308 km west of Calgary, Alberta. Take the Trans Canada Highway west and then Highway 93 south to Invermere, B.C. Panorama is 18 km west of Invermere. 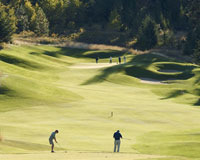 Greywolf maintains a driving range, a practice facility and offerings for groups, juniors and more. Welcome to Harrison Hot Springs Resort and Spa, and to a sensually relaxing, scenery-filled Fraser Valley British Columbia golf vacation that includes hot springs, airtrams, helicopter tours, the Sasquatch Provincial Park - and golf almost everywhere you turn. What’s rare about this golf getaway is that the onsite course - the Harrison Resort Golf Course - is considered "the best kept secret in Fraser Valley” even though it only has nine holes. This 90-acre, 3,375-yard course is PGA rated and suitable for golfers of all levels and ages. For a little variety, you can also easily sample any of the BC Rocky Mountain golf courses nearby, including the 18-hole, par 72 Sandpiper Golf Club in Harrison Mills, and the par 71 championship The Falls Golf and Country Club in nearby Bridal Falls. And what makes this getaway extra-special is that you’ll have your choice of activities year-round, with the resort marina and the beaches, boating and kayaking of Harrison Lake just outside and five natural hot mineral pools on the resort grounds. For family, for romance, for fun…and for plenty of golf…this is your British Columbia vacation destination. Put the natural mineral springs to their best use at the resort’s sumptuous onsite spa, combining the healing waters with world-class treatments and services. The original resort was built here in 1886, and was then called the St. Alice Hotel and Bath House. It served guests from Vancouver seeking the healing properties of the natural mineral hot springs. Harrison Hot Springs Resort & Spa offers seasonal group travel and vacation tours year round, including powder skiing, guided Harrison River fishing tours, whitewater rafting and more. One of the keys to golf at Fairmont Hot Springs is that in BC’s Columbia Valley, the weather tends to be warmer and the golf seasons tend to be longer than almost anywhere else in Canada. And if you’ve golfed the championship Mountainside course, you know that the same goes for the fairways. We’re talking about the “Fairmonster,” the 600-yard fourth hole that is gaining fame among even the longest hitters. Actually, the whole course is pretty challenging - so it’s a good thing that there are two more courses here for any player. The Riverside is a CPGA-quality 18-hole course that undulates through varied terrain; the headwaters of the Columbia River have a way of eating your golf balls occasionally, most often on the signature fifth hole which crosses the river twice. And the Creekside course features nine par 3 holes for families, for practice and just for fun. Next to these courses, perhaps the biggest experience on your Fairmont Hot Springs golf getaway will be dipping into the legendary mineral springs that give the resort its name. There are also trail rides, tennis, a ski resort and more here; it’s simply an unforgettable British Columbia vacation. The lodge at Fairmont Hot Springs encompasses fine dining, shopping, spa services, a fitness centre and access to the famous mineral springs. From Calgary, Alberta, travel west on the TransCanada Highway. Approximately 25 kilometres past Banff, at Castle Mountain Junction, turn south onto Highway 93 toward Radium Hot Springs. At the junction where Highway 93 meets Highway 95 (in Radium), turn south (left). Fairmont Hot Springs is about 25 minutes south of Radium. Fairmont Hot Springs offers weekly golf clinics, junior camps and private and semi-private lessons from two CPGA professionals at the Riverside Driving Range. You can’t mention British Columbia golf without mentioning Trickle Creek Golf Course in Kimberly. And you can’t mention Trickle Creek Golf Course unless you include Trickle Creek Lodge in the same breath - it’s pretty much the 19th hole of the course itself. “Thrilling” is a good word to describe golf at Trickle Creek. Its Les Furber design makes the most of North Star Mountain and the surrounding East Kootenay Mountains and provides plenty of make-you-gasp scenery, especially from the tee at the signature 11th hole. Fortunately or not, you’re likely to have the same reaction to many of the fairways, which many times have you looking down at them from the tee or upward at the green. Holes 12 and 13 feature sharp doglegs, first left and then right respectively. Gasp! Your reward is the Trickle Creek Lodge, with all the lodgepole pine-beam ambiance of a classic mountain ski resort - which it is, in the wintertime. The best part is the lodge provides preferred tee times and reduced green fees at the Trickle Creek course, along with tee times to all of the region’s major courses. Explore the city of Kimberley - known as the “highest city in Canada” at 1,120 metres above sea level - for its Bavarian-themed downtown including the Platzl open air market. From Calgary, Alberta, take Highway #1 west to Highway #95 south to Highway 95a into Kimberley; or, follow Highway #1 south to Highway #22 southwest to Highway #3/93 to Highway #95A north into Kimberley. Full conference and banquet facilities at Trickle Creek Lodge make it ideal for BC Rockies business retreats and events. Sun Peaks Resort claims that its 18-hole golf course is naturally challenging and uniquely beautiful. And here in the Kamloops area you’ll notice it helps with the challenge, and it sure is beautiful, when your golf ball flies an extra 30 yards at 4,000 feet above sea level. You’ll also notice the spectacular mountain panaromas at every turn on this Graham Cooke-designed masterpiece. The elevated tee at the 16th hole gives you an unforgettable view of Mt. Morrissey, and landmarks like McGillivray Creek lend peace to your BC golf experience. Which you might need, since there’s plenty of good sport-style adversity here too. The new back nine welcomes you with a 566-yard par 5, and several holes have deceptively sloping greens. If you’re not extra careful on the 17th, the 163-yard par 3 distance could be the least of your problems. All of this fun takes place in the context of a wonderful British Columbia family resort, with an Adventure Centre that’s your source for endless outdoor activities including the popular bungee trampoline. A summer mountain bike park transforms into a full-service ski resort in the winter - a year round Kamloops vacation! Golf season begins in late May end extends through early October from 8 a.m. to dusk daily. The Sun Peaks golf course is the highest-elevation course in British Columbia. The practice facility at the Sun Peaks course includes a driving range, a putting green and chipping and practice bunkers. The golf shop offers individual and group lessons.